Goodness gracious! The weekend flew by. Saturday was my wedding anniversary, 22 years with Bookman, almost half my life. That makes me feel old but also very happy. We celebrated by going out to breakfast and then buying a new sofa at Ikea. I also got a new table for my sewing machine, one that has drawers and will not wobble. Which means I need to oil my machine and start sewing again. All in good time. Of course, since the items were from Ikea there was some assembly required. If you ever want to test the strength of a relationship, try assembling Ikea furniture together. We passed with flying colors if I do say so myself. There was also some outdoor time Sunday. The weather was sunny and 58F (15C), a heat wave when compared to what it’s been like. We even had the window open most of the afternoon which made Waldo and Dickens very happy. We pulled out all the dead plants from the veggie beds. We also saved seeds from the zinnias, bachelor buttons, calendula, and yellow beans before pulling out the dead plants. We trimmed the climbing rose a bit too. And talked a little about where to put down black plastic on the remaining grass to make new beds in the spring. We didn’t pick any fresh herbs from the herb spiral during the summer because the plants needed to grow and get established. As I was pulling out the bachelor buttons and calendula that we had planted in the spiral, I noticed how big the sage and oregano had gotten. They had not been killed by frost yet so I snipped off some of the leaves and brought them indoors. I got out the food dehydrator and and in a few hours I had dried herbs. I had thought briefly about tying the herbs in bunches and hanging them up to dry the old fashioned way but I have nowhere to hang them out of the way and there is still a bit of humidity in the air and I didn’t want to worry about mold and mildew. It was still satisfying though, crumbling up the dried leaves into the spice jars for Bookman to use in his cooking. I finally got all the remaining chaff out of the mustard seeds from the garden and have them, along with some supplementary seed we had to buy, soaking in vinegar and spices. They have to soak for two days and then we can turn them into creamy mustard. Fingers crossed! 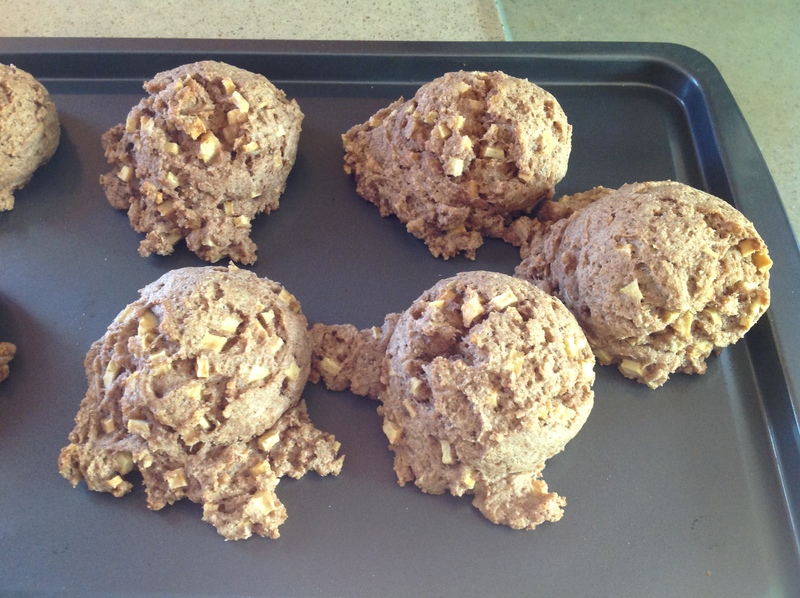 Bookman also made some tasty apple spice scones with some of the apples from our trees. We still have so many apples it’s crazy. An apple pie will be coming soon. Bookman wants to experiment canning apple pie filling. Has anyone done this before and have advice? And we have to start working on preserving all those pumpkins we picked last week too. So much to do! All this means I pretty much read nothing all weekend which feels odd because it is so rare. I did read the introduction to Hecuba in my copy of the play and oh, it sounds fantastic! I hope to start reading the play today. I have today through Wednesday off from work and so does Bookman. We’ve got plans to be lazy and plans to be out and about. Reading, goofing off, eating those apple scones, going to a book event and to an art exhibit and who knows what other fun things. How we are going to fit all this into only three days, I don’t know, but by golly, we are going to try! I love drying my own herbs. I used to hang them in bunches but sometimes they did get too much humidity. I often dry them in the over- warm it and then turn it off and put the herbs in on trays. It works okay but leaves them darker color. Jeane, thanks for the tip about drying herbs in the oven! Happy anniversary! Putting together IKEA furniture is definitely a test of a marriage. Jeanne, thanks! We are now old pros at it but in the beginning, oh it got snippy sometimes! A big congratulations and even bigger hug to you and Bookman! here’s best wishes for another 220 years of togetherness! Cheers! Belated anniversary wishes – how nice. I’ve never made scones as the first time I tried one somewhere it was so dry. I’d like to try maple ones. Happy Anniversary!! I am envious of your apple tree. My neighbor has one but the apples are not good, which is so sad! They are super mealy and not sweet. I think it’s too hot here. wherethereisjoy, thanks! My apples are pretty tart but we knew they would be since we have a cooking tree and an eating tree. The eating tree does not produce good apples unfortunately that’s we we planted a honeycrisp in the backyard. Hopefully when it starts producing it will be good! Congratulations to you both. Wishing you many, many more years of togetherness and joy. Happy Anniversary to you guys! It sounds like you’ve been having fun celebrating and more fun to come! Those scones look yummy. Thanks Arti! I always used to give my parents a hard time when I was a kid for not having splashy anniversary celebrations but I totally get it now. Ruth, thanks! I love apples, you can do so many things with them! Oh you are so YOUNG Stefanie. Wait until you’ve been married many more years than half your life. THEN I’ll allow you to feel old – if I’m still around to be reading you. LOL! Seriously though, congratulations. How great to have 3 days off to enjoy. I hope you made the most of it – sounds like you were going to give it a darn good try. I look forward to hearing what you did. whisperinggums, LOL. It is heartening to be called young 🙂 Thanks for the good wishes. We had a lovely time off together. Sage is an evergreen shrub. It should stay green (or grey or purple or whatever color your particular cultivar is normally) all winter. That is, if it survives the Minnesota cold. Severalfourmany, good to know about sage being evergreen, I’ve never tried to growi it before. It will, however, eventually be buried in snow so we’ll see if it survives! Congratulations to you both on your anniversary! I like the sound of your lazy days very much, hopefully everything, including the goofing off, was as you hoped it would be. Danielle, it was really wonderful time off. It is always bittersweet pulling up the garden. Thanks for the good wishes! Happy Anniversary! It has been so warm here that plants have started an new growth. I cut the asclepius down to the ground at the end of August, and it is now about 3 ft. and blooming again. We need a frost and some cooler weather to kill the dratted mosquitoes! Jen, Thanks! Wow, you must have super growing weather where you are! I hear you on the mosquitoes. One of the reasons I look forward to frost is no more of the little vampires! Happy Anniversary! The Bears say that if there are any scones left they will come and help you celebrate and eat up any spares. Congratulations on your anniversary, our 22nd is so far in the past I can’t even remember it, that’s another plus about blogging, you have your blogpost to jog your memory. I’m sure you’ll have many more anniversaries to celebrate. I have to gather sage too as it doesn’t survive the frosts here in Scotland. pining, thanks! I don’t know if the sage will survive a Minnesota winter or not since I have never grown it before. I guess I will find out! Congrats on your anniversary! That’s awesome!! Happy belated anniversary! I hope you and Bookman have many more years of joy, health, and of sharing common interests. Happy anniversary!! You and Bookman are my favourite couple on the whole interwebs.